I Corinthians 15:14 "And if Christ be not risen, then is our preaching vain, and your faith is also vain." The resurrection was essential. It should not to be taken lightly, because that one event sets Jesus apart and proves that He is, and was, the Son of God. The resurrection separates Jesus Christ from all other religious leaders throughout history. The resurrection was God's seal of authenticity upon the life of Jesus Christ and it divides cults from true Bible believing worshippers. Why? It is because, without the bodily resurrection, Jesus was just a good man, He was just a good prophet, He was just like any other religious leader in history. Also, without the bodily resurrection, there would be no salvation, there would be no redemption, there could be no forgiveness of sins. Since Jesus had promised many times that He would resurrect, if He had not, it would make Him a liar. Revelation 21:8 Had Jesus not kept this promise, then He would have invalidated all the other promises He made. There are many reasons to believe in the resurrection of Jesus Christ. For example, after the resurrection, there were over 15 appearances of Jesus Christ. One of the appearances was before over 500 people. I Corinthians 15:6. There were also the secular writings of Flavius Josephus, Cornelius Tacitus, Lucian of Samosata, and the Jewish Sanhedrin. When it comes to the resurrection, there are many religious groups who really do not teach what the Bible teaches. 1. Some claim that Christ resurrected as a spirit. Was Jesus Christ merely a spirit, a ghost, when he resurrected? There are legends in societies around the world that are filled with stories of spirits and ghosts manifesting themselves to people. For many people, a spirit resurrection would seem legitimate. This would seem to make some sense and explain away what this miracle actually was, but there are problems with it. They were busy looking at his hands and feet, probably the nail scars, and in verse 41, completely out of the blue, He asks them for some food. When most people ask for food it is because they are hungry, not just trying to be social. In verse 43, we see Him eating. If Christ was a spirit when He resurrected, He would not have had need for food, He would not have been hungry, and certainly wouldn’t have been eating. A spirit doesn't need physical food, it takes a physical body to eat and digest physical food. Jesus allowed Thomas to touch the wounds in His hands and side. This is evidence that He did not resurrect as a spirit. 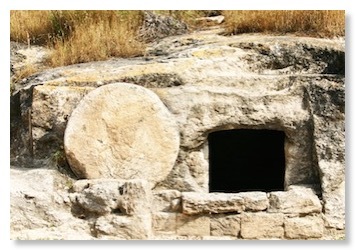 Instead He resurrected from the grave as a physical being. Some say that Christ invented the entire thing. They claim that He knew all the scriptures (John 7:15) about the messiah and planned the events to mimic the prophesies. Some actually say that the disciples were involved in drugs and they hallucinated the whole incident. I Corinthians 15:3-7 If the resurrection was a drug induced vision, than there were 500 people who were all taking drugs and saw it all at once, not to mention the other sightings. This isn’t rational and could not be the case. They say that Christ fainted on the cross and was revived later. Matthew 28:1-6 If Christ fainted and revived later, than how did He get out of the tomb. Someone might explain that it was because of the earth quake. If Jesus did get out of the tomb, than how did he blind and terrify the soldiers with light? They didn't even have electricity, never mind bright lights back then. How could this brightness even occur? There’s no rational way this could happen. Some claim that there was a spirit revived inside of them, and that it was not a physical resurrection. This could not be true. The reason is because after the resurrection not one of his disciples remembered, or believed, that He would bodily resurrect from the grave. They didn’t believe Christ would rise from the dead, even after He had told them multiple times. Mark 16:1-3; John 20:13; Luke 24:12 None of Christ’s disciples believed that He resurrected, so it couldn’t have been in their hearts. This statement shows the eternal quality that Jesus Christ possessed, because only an eternal being can be an "I AM”. The verse also tells us that He existed before Abraham who was alive over 2000 years before Christ. John 14:9 - Again in this verse He tells them that He is God on earth. John 8:28 - The crucifixion and resurrection were proof that Jesus was who he said he was. They were the verification. The Bible predicted the whole crucifixion and resurrection scene in Psalm 22 and Isaiah 53. Although they knew the scriptures, it was not as clear until afterward because hindsight is 20/20. 1. It proves the resurrection was a real event. 2. It proves that Jesus was NOT like any other religious leader in history. 3. It proves Jesus was who He said He was, God in the flesh. The death described in Romans 6:23 is not referring to our physical death, it is a reference to eternal death, separation from God in a place called the lake of fire. The wage/payment for our sins. Revelation 20:14-15; 21:8 This is why the crucifixion and resurrection were so important. We have to believe the scriptures that we are a guilty sinner, God has a gift for each of us, and that gift is eternal life in heaven. It was purchased with the blood of Jesus Christ 2000 years ago.